With Leaf-Spine configurations, all devices are exactly the same number of segments away and contain a predictable and consistent amount of delay or latency for traveling information. This is possible because of the new topology design that has only two layers, the Leaf layer and Spine layer. 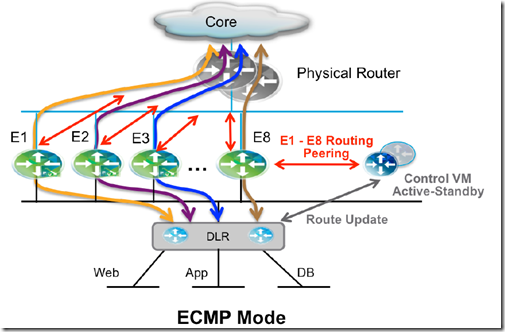 The Leaf layer consists of access switches that connect to devices like servers, firewalls, load balancers, and edge routers. The Spine layer is the backbone of the network, where every Leaf switch is interconnected with each and every Spine switch. and the core, where aggregation switches interconnect to each other and to networks outside of the data center. Physically scaling the three-layer model involves identifying port density requirements and purchasing an appropriate number of switches for each layer. Structured cabling requirements are also predictable, as interconnecting between layers is done the same way across the data center. growing a three-layer network is as simple as ordering more switches and running more cable against well-known capital and operational cost numbers. The 3 Tiered topology ( composed by Core-Aggregation-Access) could be inefficient in a datacenter context: problem with bottleneck occurred by Eest-West traffic, non-linear scaling in terms of performance and costs and not completing consumption of the available network resources, has been favored the adoption of the leaf-spine network topology. A leaf-spine design scales horizontally through the addition of spine switches, which spanning-tree deployments with a traditional three-layer design cannot do. This is similar to the traditional three-layer design, just with more switches in the spine layer. In a leaf-spine topology, all links are used to forward traffic, often using modern spanning-tree protocol replacements such as Transparent Interconnection of Lots of Links (TRILL) or Shortest Path Bridging (SPB). TRILL and SPB provide forwarding across all available links, while still maintaining a loop-free network topology, similar to routed networks. supports fixed configuration switches –> Leaf-spine allows for interconnections to be spread across a large number of spine switches, obviating the need for massive chassis switches in some leaf-spine designs. 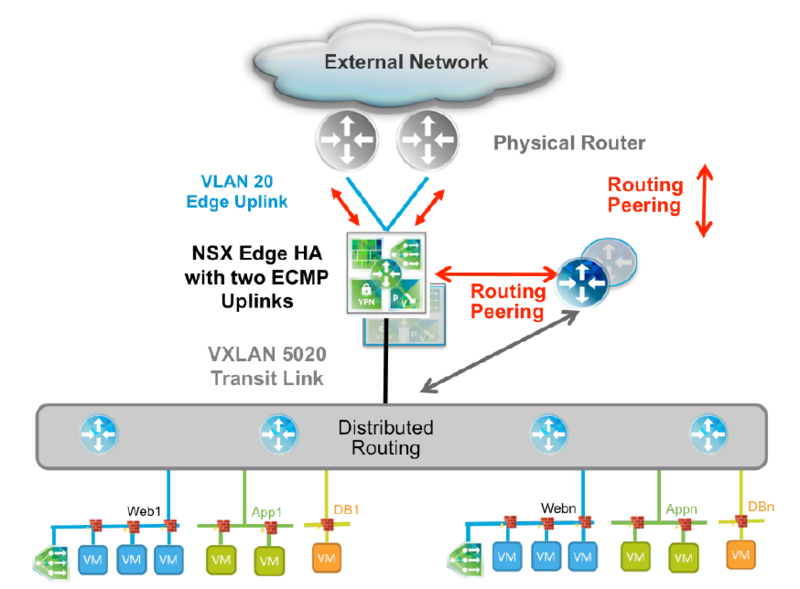 Differentiate virtual network topologies and Given a specific physical topology, determine what challenges could be addressed by a VMware NSX implementation. A typical multi-tier application architecture is composed by database tier, application tier and presentation/web tier. 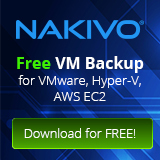 All tier must be protected against networks attacks and could be assisted by load-balancer and/or VPN as well. 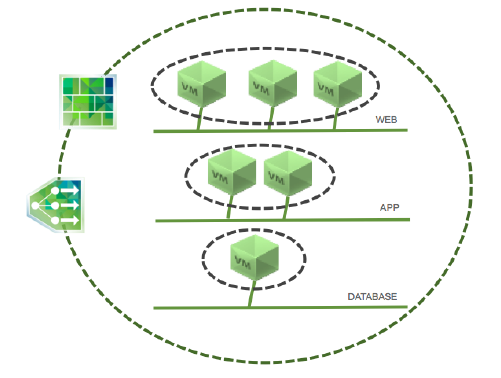 Every network segments which provide network connection between VMs in the same tier must be “isolated”. 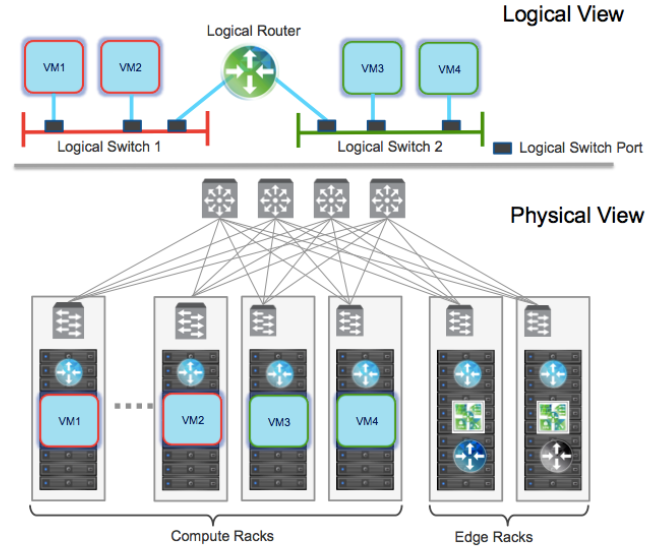 The logical switching capability in the NSX platform provides the ability to spin up isolated logical L2 networks with the same flexibility and agility that exists virtual machines. 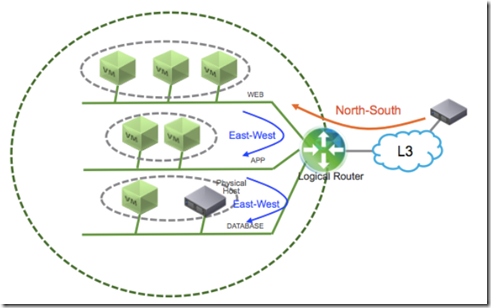 Endpoints, both virtual and physical, can connect to logical segments and establish connectivity independently from their physical location in the data center network. When utilized in conjunction with the multi-tier application previously discussed, logical switching allows creation of distinct L2 segments mapped to the different workload tiers, supporting both virtual machines and physical hosts. 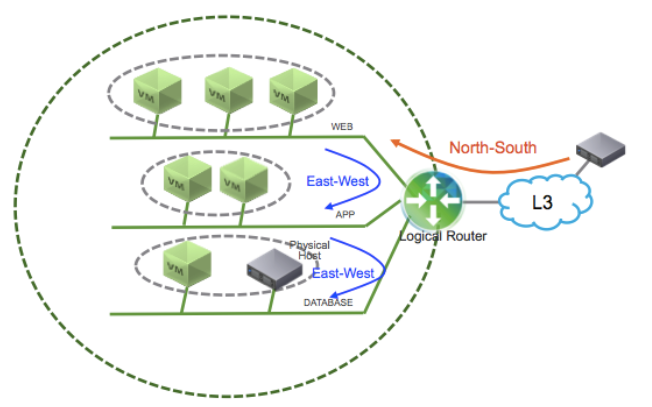 The logical routing capability in the NSX platform provides the ability to interconnect both virtual and physical endpoints deployed in different logical L2 networks. 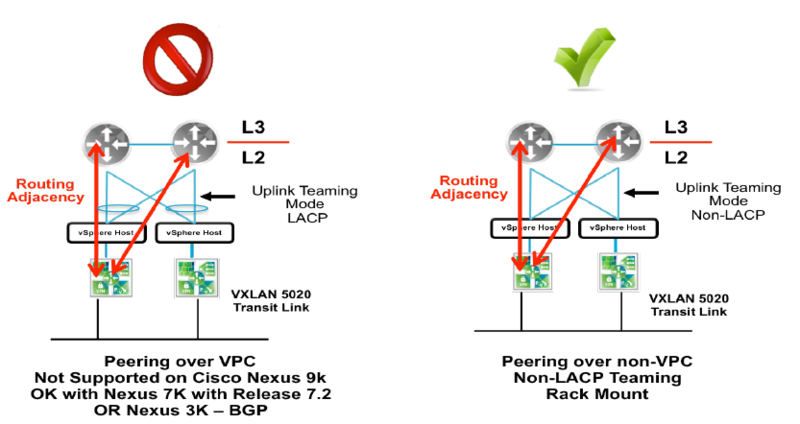 The gray routers R1 and R2 can represent either L3-capable ToR/EoR switches that serve as ABRs and are connected to the datacenter backbone OSPF area 0, or L3-capable switches positioned at the aggregation layer of a traditional pod-based datacenter network architecture that serve as the L2/L3 demarcation point. ESG1, ESG2 and DLR-1 are in the same NSSA area 52.
it is possible to reuse the same BGP ASN if the physical router devices support BGP configuration capabilities such as “neighbor <ip address> allowas-in <occurrences>” and “neighbor <ip address> as-override”. 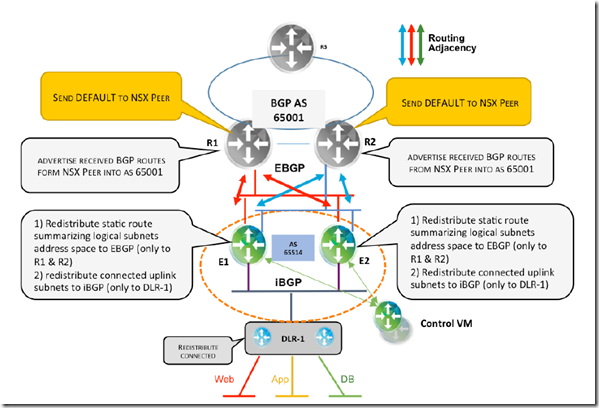 For the multi-tenant design with BGP, a summary route for the NSX tenant’s logical networks is advertised from the ESGs to the physical routers through an EBGP session. Reducing the configuration burden of advertising new logical networks introduced via automation. Avoiding routing churn caused by each new advertisement. 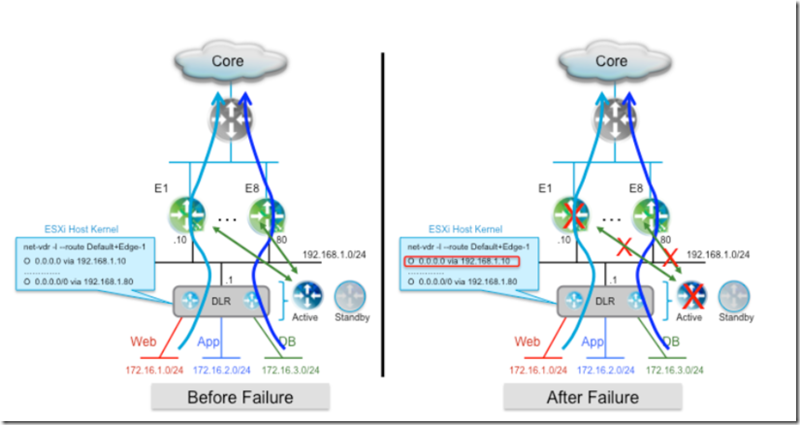 Maintaining reachability of NSX logical networks during control VM failure with aggressive timers in ECMP based design. It is not required for an ESG active-standby, stateful services design where aggressive timers are not used. 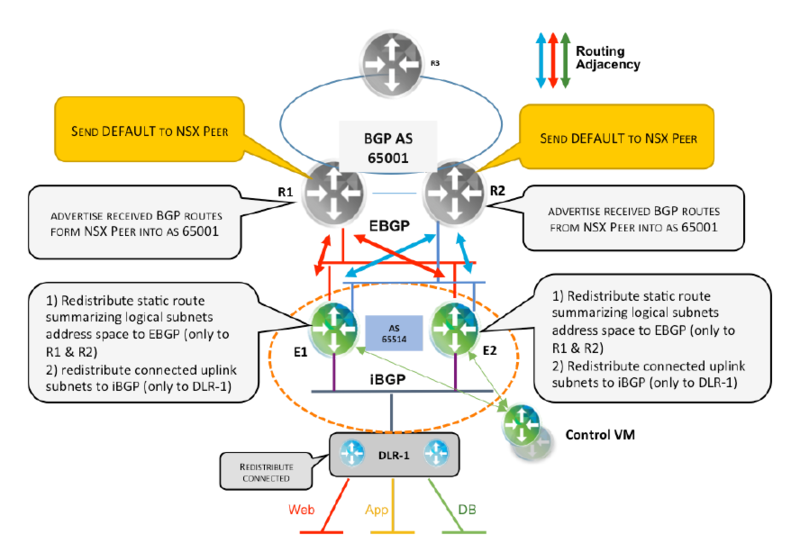 To avoid external route reachability issues, the BGP next-hop-self feature or redistribution of a connected interface from which the next hop is learned is required. Usually an iBGP domain calls for a full mesh of iBGP sessions between all the participant routers. 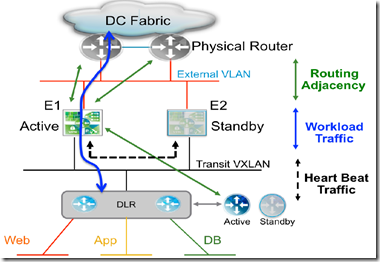 Virtualized environments must carry various types of traffic, Each traffic type has different characteristics and applies different demands on the physical switching infrastructure. The cloud operator might be offering various levels of service for tenants. Different tenants’ traffic carries different quality of service (QoS) values across the fabric. No reclassification is necessary at the server-facing port of a leaf switch. If there were a congestion point in the physical switching infrastructure, the QoS values would be evaluated to determine how traffic should be sequenced – and potentially dropped – or prioritized. 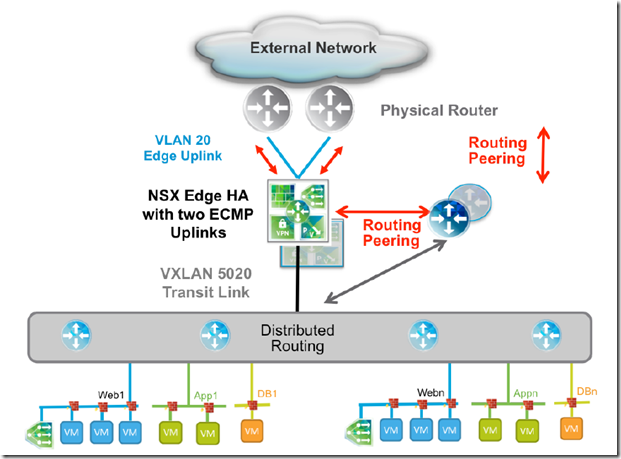 NSX allows for trusting the DSCP marking originally applied by a virtual machine or explicitly modifying and setting the DSCP value at the logical switch level –> the DSCP value is then propagated to the outer IP header of VXLAN encapsulated frames. 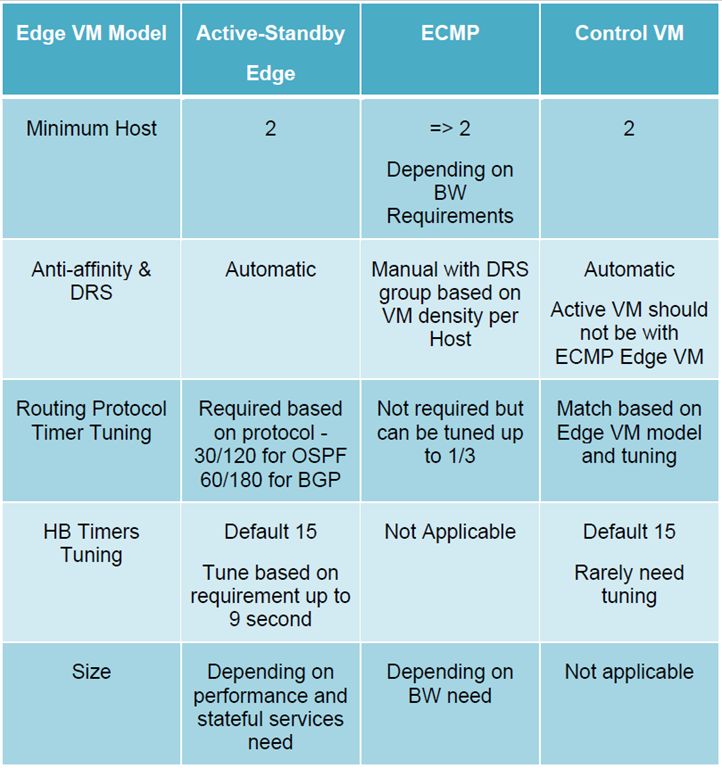 For virtualized environments, the hypervisor presents a trusted boundary, setting the respective QoS values for the different traffic types. 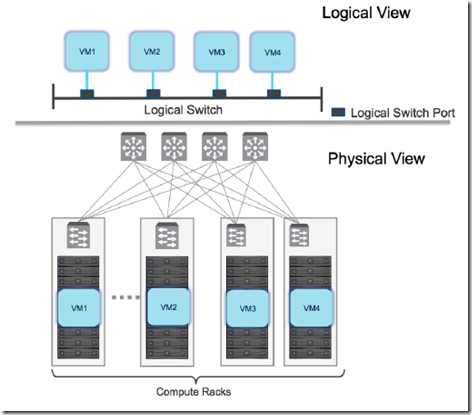 The vSphere Virtual Distributed Switch (VDS) is a foundational component in creating VXLAN logical segments. 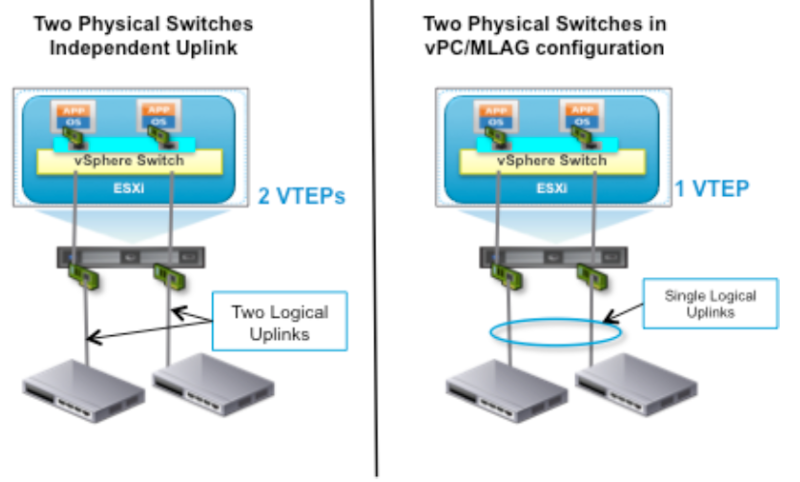 The span of VXLAN logical switches is governed by the definition of a Transport Zone –> each logical switch can span across separate VDS instances over the entire transport zone. 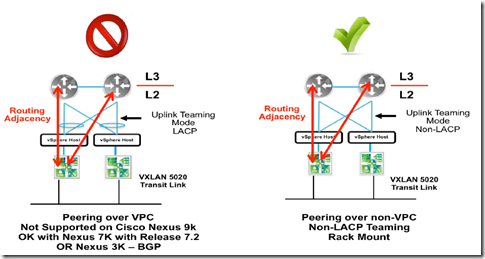 Since the single VTEP is only associated in one uplink in a non port-channel teaming mode, the bandwidth for VXLAN is constrained by the physical NIC speed. When deploying a routed data center fabric, each VLAN terminates at the leaf switch (i.e., Top-of-Rack device), so the leaf switch will provide an L3 interface for each VLAN. Such interfaces are also known as SVIs or RVIs. VXLAN Traffic: After the vSphere hosts have been prepared for network virtualization using VXLAN, a new traffic type is enabled on the hosts. 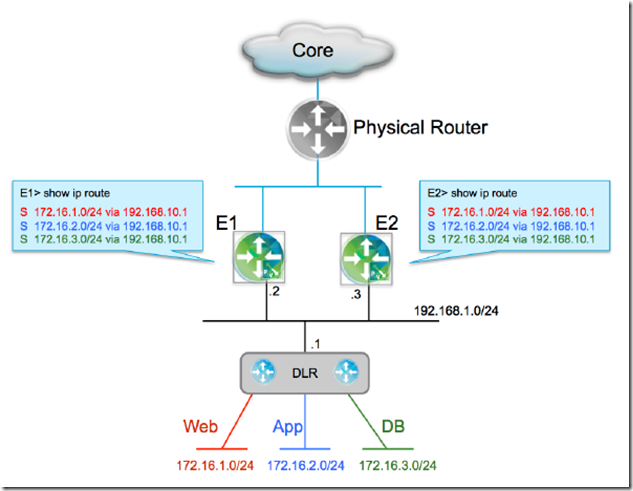 Virtual machines connected to one of the VXLAN-based logical L2 networks use this traffic type to communicate. 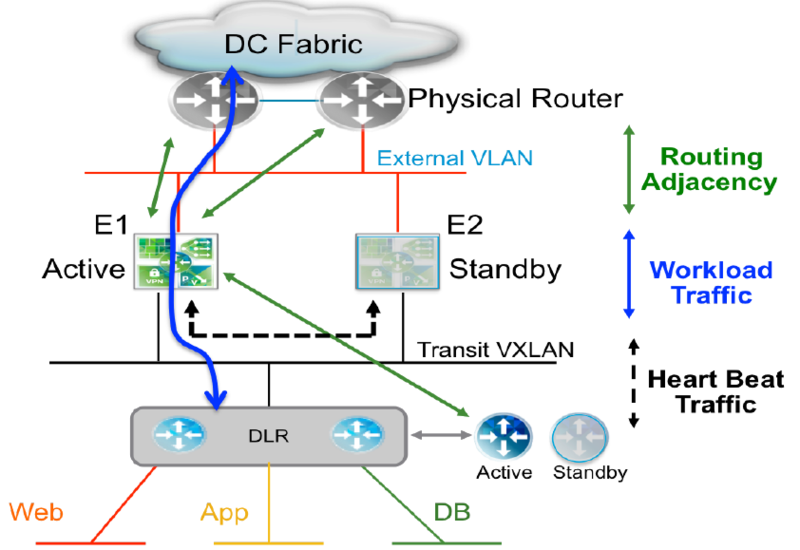 The VXLAN Tunnel Endpoint (VTEP) IP address associated with a VMkernel interface is used to transport the frame across the fabric. Management Traffic: is sourced and terminated by the management VMkernel interface on the host. 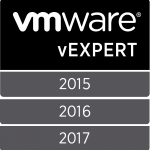 It includes the communication between vCenter Server and hosts as well as communication with other management tools such as NSX manager. 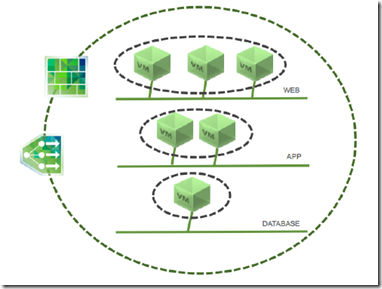 vMotion traffic: is used to move this virtual machine state. Each vSphere vMotion VMkernel interface on the host is assigned an IP address. Depending on the speed of the physical NIC, the number of simultaneous virtual machine vSphere vMotion migrations is decided. Storage traffic: is used to provide features such as shared or non-directly attached storage (NAS, iSCSI). This subnet cannot span beyond this leaf switch, therefore the storage VMkernel interface IP of a host in a different rack is in a different subnet. Once the standby is activated, it starts all the services that were running on the failed Edge. 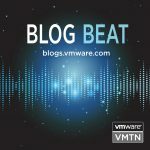 Traffic in the south-to-north direction continues to flow since the forwarding tables in the kernel of the ESXi hosts remain programmed with the original routing information received from the Edge. 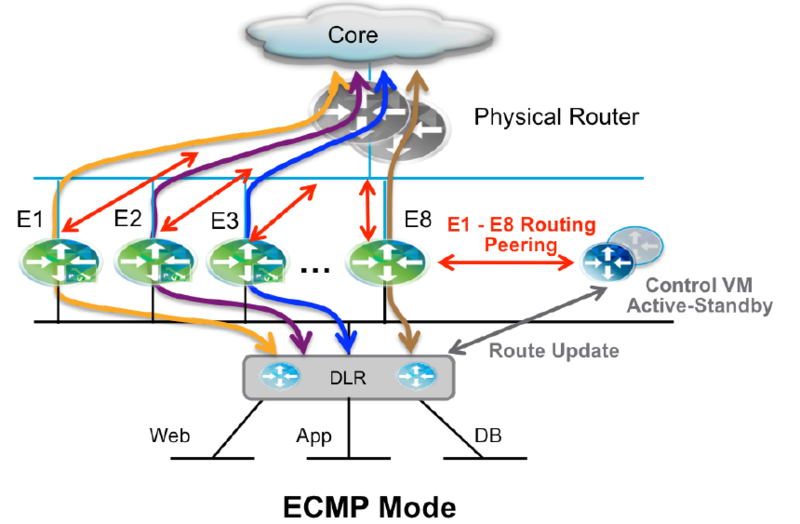 The aggressive setting of routing protocol timers as applied to ECMP mode for faster recovery has an important implication when dealing with the specific failure scenario of the active control VM –> This failure would now cause ECMP Edges to bring down the routing adjacencies previously established with the control VM in less than 3 seconds. To mitigate this failure of traffic, static route with a higher administrative distance than the dynamic routing protocol used between ESG and DLR are needed. There is no requirement to configure static routing information on the DLR side. 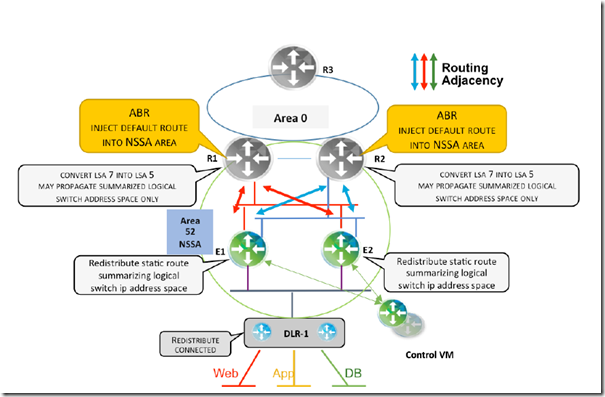 If the active control VM fails and the standby takes over and restarts the routing services, the routing information in its forwarding table remains unchanged. 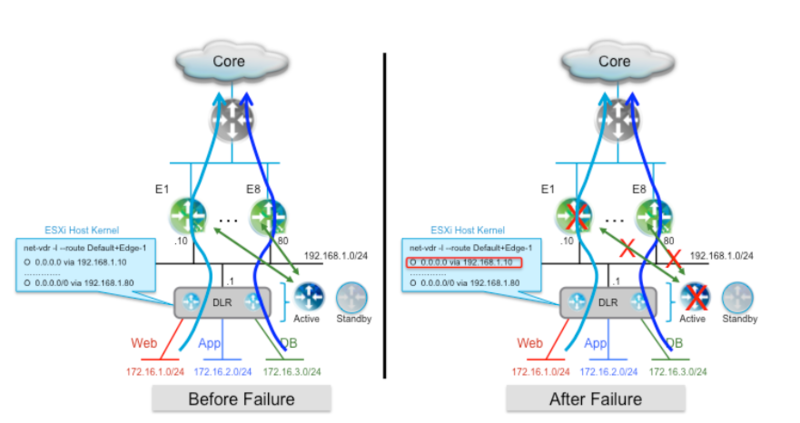 There is an additional important failure scenario for NSX Edge devices in ECMP mode; the failure of the active control VM caused by the failure of the ESXi host where the control VM is deployed together with one of the NSX Edge router. 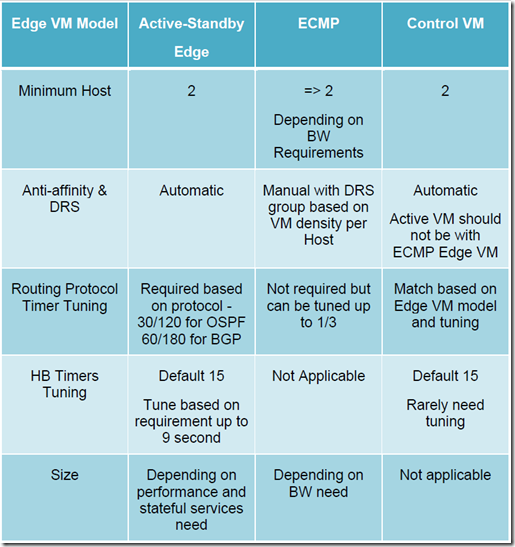 In this failure event, the control VM cannot detect the failure of the Edge since it has also failed and the standby control VM is still being activated. 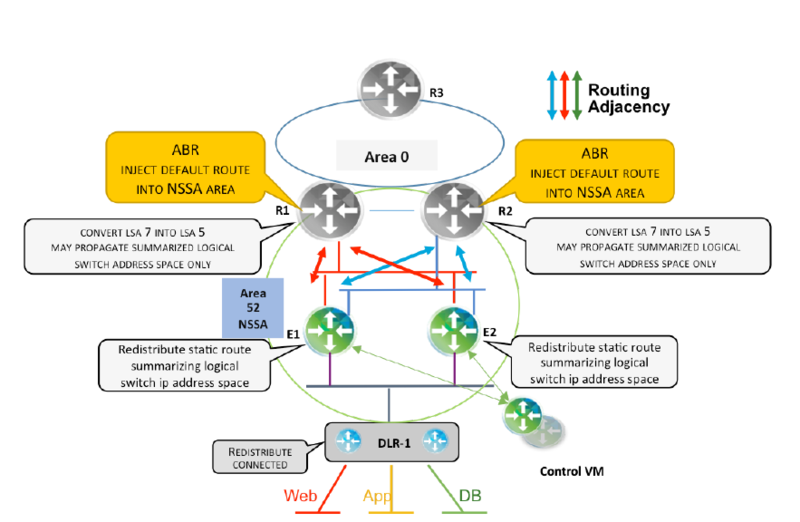 As a consequence, the routing information in the ESXi host’s kernel still shows a valid path for south-to-north communication via the failed Edge device.This state will exist until the standby control VM is activated, it restarts its routing services, and reestablishes adjacencies with the Edges. This will lead to a long outage for all the traffic flows that are sent via the failed Edge unit. 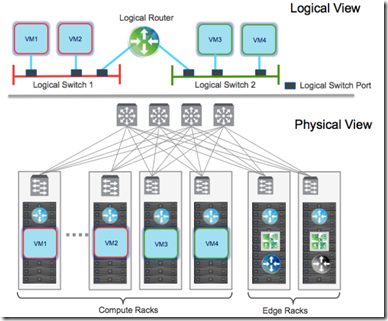 Deploying the Control VMs in the management cluster –> small design with collapsed clusters.